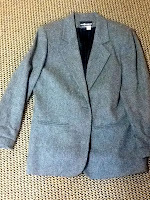 What to do with either outdated jackets, or when you have too many? 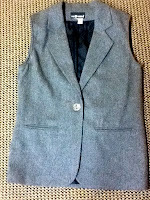 Within about 30 minutes my old grey, wool jacket turned into a vest I will wear quite a bit more often! 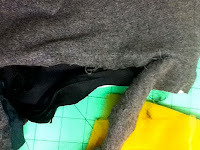 Grab the scissors and cut off most of the sleeves. This just made it easier for me to finish ripping the entire sleeve out. 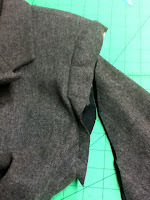 Snip the rest of the sleeve away to the raw edge. 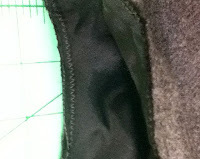 I just cut the inside lining right up to the previous sleeve sewn line. Next zigzag the lining to the raw edge of the armhole. Turn under about 1/2 inch and sew. 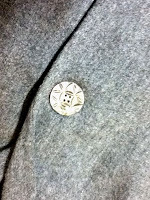 Add a new button and you have a "new" vest! Next to recycle another sweater! This is a brilliant idea. I refurbished an old denim vest which was looking a bit worn with some colourful crazy patchwork. Have had lots of compliments about it. I can see how patchwork would really snaz it up! Fun to just use what we have, and update or change around to a new garment.